Who doesn’t love a cute and tasty treat? Come paint darling cupcakes with your best friend that you can decorate however you please! We have a special partnership with Bubble Pop! We'll be painting AND playing with Bubbles! Your ticket pays for a pair of painters plus a bubble play session! Introducing a Mommy and Me (or Daddy and Me, Parent and Me, Guardian and Me) Painting Class at our Neighbor two doors down, Bubble Pop!! Painting class open to ages 4 and up! Join us to Paint, play with Bubbles and Have Fun!! Seats are limited, sign up today! 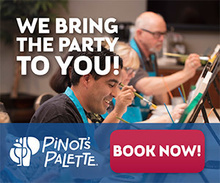 Learn More About Bubble Pop at http://ocbubblepop.com/ - your tickets to paint also include a Bubble Play session!